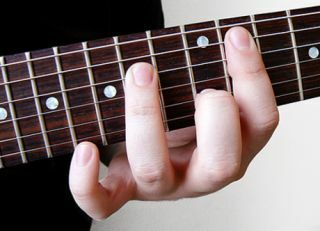 As we all know, there's nothing wrong with the good old open E chord, with its role at the heart of so much great music. Sometimes, though, you want to be a bit more sophisticated, and these alternatives are all designed to give a rich, expansive, sound. This E6/9 could easily be (ab)used as the final chord of a cheesy country hoedown, but it'll also work perfectly well for a dreamy Hendrix ballad... think Angel or SRV's Lenny. This one is a bit more awkward to finger, but it's worth the effort. Arpeggiate from high to low to hear the adjacent scale notes D#, E, F# and G#. Another Emaj9, but this one is more movable, apart from the bass note. It also lends itself to Hendrix-style ballad work... try interspersing it with some sliding doublestops.